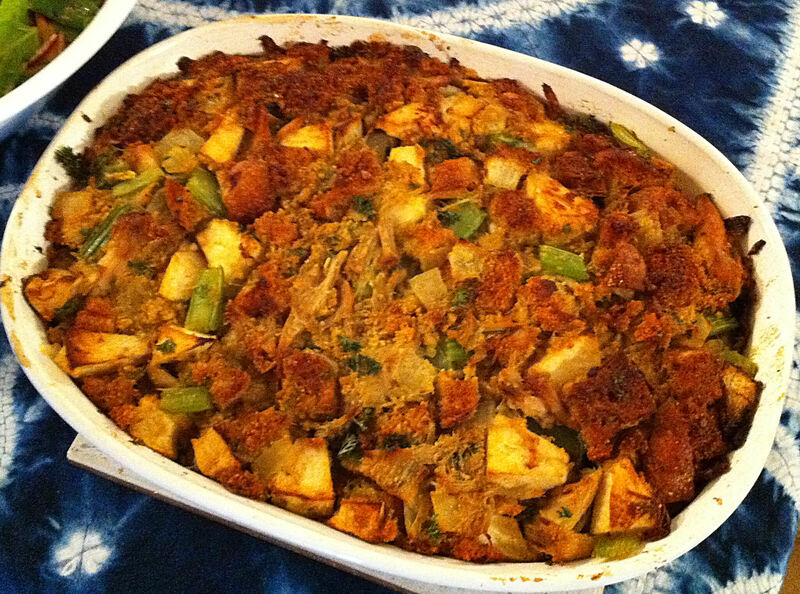 My Thanksgiving stuffing is based on my mother’ s dressing. I may play around with the other sides and how I cook the turkey, but this is something that I always make very close to the same way each year. I have made many improvements on my mother’s recipe over the years, but this—more than the turkey—says, “Thanksgiving” to me. I always cook my dressing outside the bird (for sanitary reasons—once you have had salmonella you will go to great lengths not to repeat the experience), but I do like the meaty flavor that you get when the bird’s juices infuse the dressing. My solution, and one of the keys to this dish, is stewing the neck (and any other parts available, except the liver) in chicken stock for at least an hour. This produces the best of both worlds—safety and flavor. This year I encountered a problem. After defrosting my bird I found that it was neck-less. In fact, there were no giblets at all, there was only bird in my bag. I thought to run to the store to buy a neck, but they were also sold out. I had to settle on a bag of turkey wings to make the meaty stock for my stuffing. As I am usually making many dishes for the Thanksgiving meal and I frequently take some short cuts. This year, Miriam and Chris were bringing some dishes, so I decided to go all out on the ones I was making. This year, instead of buying some seasoned bread cubes for my stuffing I decided to make my own. Note: I always used to made this stuffing with pecans, but now I am allergic—so sad. 1. Make the corn bread according to the package directions, but pour it into a 9×12 inch pan. Tip: This technique produces a very thin corn bread that has a lot of crust. This crust keeps the corn bread from crumbling into mush when you add the liquid later on. Note: You will want to make 5-6 cups of cubed bread, use as much of the corn bread and sour dough bread as you think you will need. 2. Before cutting the bread up, brush both sides of each slice with melted butter and sprinkle them with the Bell’s Seasoning. 3. Cut the bread into half inch cubes and lay them in a single layer on a shallow lipped baking sheet. 4. Bake the bread cubes for 30 minutes at 300º F.
Tip: Toss the bread cubes once to redistribute them after 15 minutes. This will prevent the cubes along the edges of the pan from over cooking and burning. 5. Turn the oven off and leave the bread cubes in the warm oven for another 30 minutes. 6. In a small pot, brown the turkey parts well in a bit of butter or oil. 7. Add 3 cups water or broth and simmer for about 30 min. to an hour. 8. When the meat starts falling off the bones, cool and separate the meat from the bones. 9. Chop the meat into small pieces and return it to the stock. Tip: If necessary, add water or stock so you have about 2 cups of stock remaining to make the stuffing. 10. In a medium skillet, melt the remaining butter over a medium-high heat. Sauté the onions, salt, and celery until just softened, about 4-5 minutes. 11. Pull the vegetables to the sides of the and add the garlic to the hole in the center. Sauté the garlic until fragrant, about one minute. 12. Mix in apples, herbs, & pepper and sauté for another 2 minutes. 13. In a large bowl, add the bread cubes, eggs, parsley, and pecans (if using). 14. Add the vegetable mixture and stock to bowl and combine well. Tip: Use the stock to rinse out the pan and add it to the bowl. 16. Pour the stuffing into a large Pam-ed casserole dish. 17. Bake the stuffing for 40-50 minutes at 350º F.